If you are a fan of Pixel / Block Style Block Games like Minecraft, Survivalcraft, Blockheads or Terraria, then you must try this new Pixel Style Block FPS! So much fun is waiting for you! Or if you’ve been enjoying Cops N Robbers, the Mini Game, then you will love Prison Break Craft even more! HELP MICHAEL ESCAPE BLOCK PRISON! Blockhead Michael is stuck in the prison. Michael was falsely charged by corrupted Block Cops and sentenced to life. He has a lovely family outside to protect. Now, he needs your help more than ever. Help him escape the Prison! Steady Your Aim and Fire your Epic Weapons! MP5, UMP, Silent Glock, F90, Desert Eagle, Shotgun, TMP, AK47 and more coming! Play across the 5 stages with Thrilling Story line, Fun Missions and various Cops, Guards, Special Agents and Pig Cops to defeat! Join Michael on his journey to escape the prison and take revenge against corrupted Block Cops. Enemies and Mobs are coming at you from all directions! Kill them all and get your Bonus Butter in return. 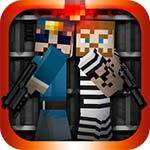 Download Prison Break Craft now and escape the Block Prison with Michael.